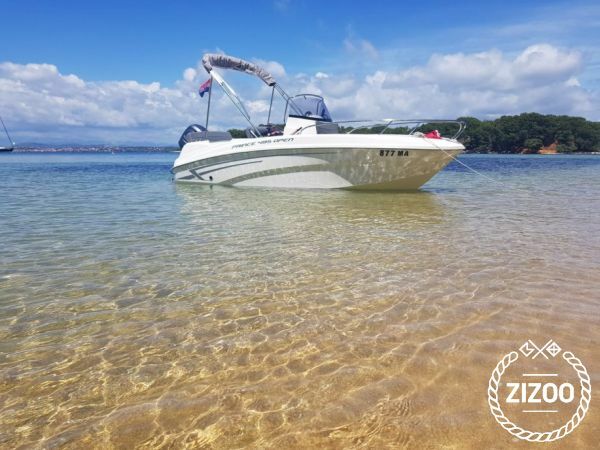 Prince 495 Open with capacity for 5 people and with 40/60 Yamaha engine (8L of fuel/1h at 20nm/h), equipped with bimini sun cover, sundeck with cushioning, ladder for easy entrance after swimming, GPS + sonar, stereo FM/AM radio with bluetooth and USB, life jackets, anchor. The motorboat is equipped with all of the necessary sailing safety items that you may need to have a carefree and safe environment while sailing. It is always superbly clean and comfortable and allows for those unforgettable moments sailing with friends or family to come to life. If you are amateur or more experienced sailors and depending on your level of skill and the possession of a valid license (category B is required) you can decide to sail the motorboat yourself or let one of our professional skippers take you on a holiday of your dreams. The price of the skipper is 100 euro per day. With the best price, all the hidden beaches are becoming available to you for your unique experience of summer and sea!